Parents and teachers need strategies for helping children with ADHD who have problems in organization, behavior, study habits, reading, written language, and socialization. 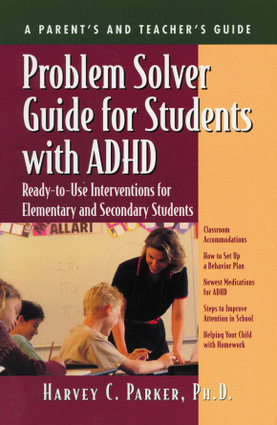 The hundreds of solutions offered in this quick-reference guide offer nuts and bolts ideas that work with ADHD kids in both elementary and secondary school. Information is offered on how to help students with short attention spans, how to reduce disruptive behavior, and how to improve reading comprehension, math skills, and written language. Also recommended are study strategies to improve organization, time management, and note taking, as well as social skills tips to help students get along better with others. Harvey C. Parker, PhD, is a clinical psychologist and cofounder and former executive director of CHADD, Children and Adults with Attention Deficit Disorders. He lives in Plantation, Florida.